Again, poor lighting, if that Light Box shows up tomorrow, I'll reshoot this one. 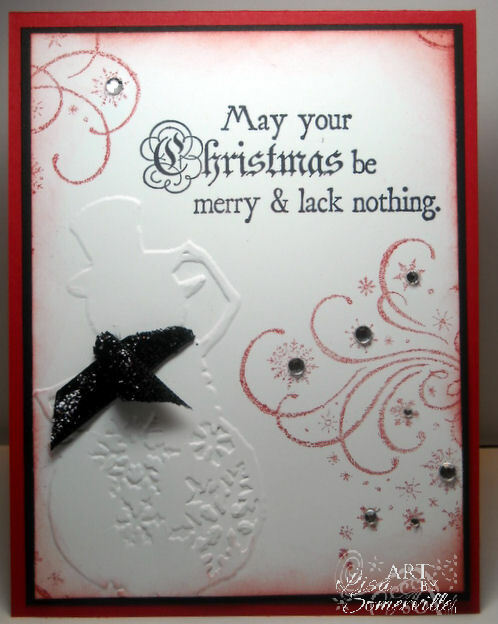 Here I've sponged the edges and added a piece of Black Glittered Ribbon (thanks Sue!). Off to catch up on Tim's Tags! 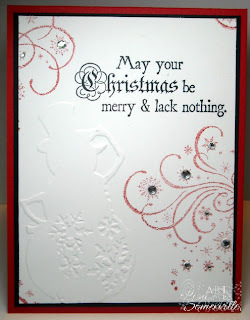 Great idea, makes wonderful Christmas cards. Beautiful cards. I like the clean look of card 1 the best. Gorgeous idea! Still waiting on that tag tho! LOL! Oh my Lisa ~ This is elegance to perfection...How beautiful!! TFS!!! For the past 2 birthdays, Paul has said 'go get yourself a light box'...and I still haven't! So great to have you with us this week! You're missed!